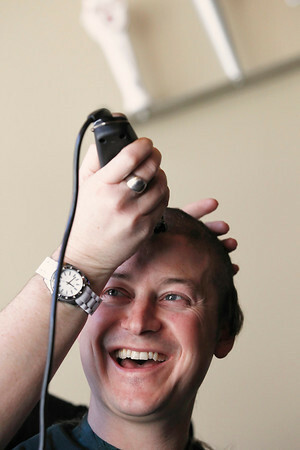 Short's Brewing Company owner Joe Short has his head shaved by Amanda Fenlon-Tschudy Saturday, one of a dozen people who raised over $12,000 and had their heads shaved during Saturday's St. Baldrick's Foundation head shaving fundraiser at 7 Monks Taproom in Traverse City. The charity raises money for finding cures for childhood cancer. The name is a combination of "bald" and "St. Patrick's," with the first event held on St. Patrick's Day in 2000. The foundation will also hold events at Gaylord High School and The Jolly Pumpkin on Old Mission Peninsula on Friday, March 16, and at Killenny's Irish Public House in Traverse City on Saturday, March 17.